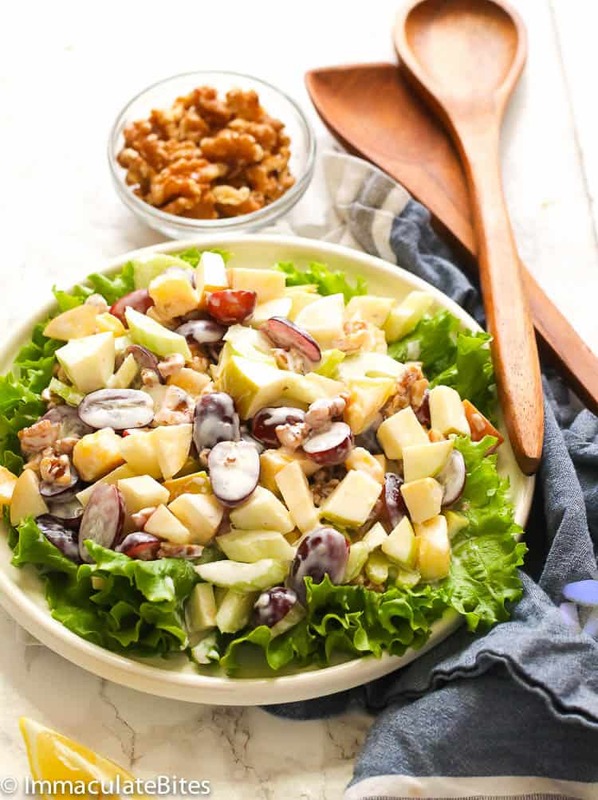 Waldorf Salad – a delightful and easy fruit and nut salad served on a bed of lettuce as a light appetizer or a meal on its own. A great dish to welcome the Spring season! Nothing would be as better as a big bowl of slightly chilled fresh and crisp salad to welcome this vibrant spring season. It’s this time of the year that we stock up our fridge with fresh produce. I’ve always been honest with you guys how much I love meat and all the fried treats (Puff Puff, I’m talking about you..haha). Although I’m still a work in progress, fortunately, I am now able to balance my food intake. Ever since we got our new @CafeAppliances (which I also talked a bit with our oven) , our monthly menu has been all set along with our groceries. 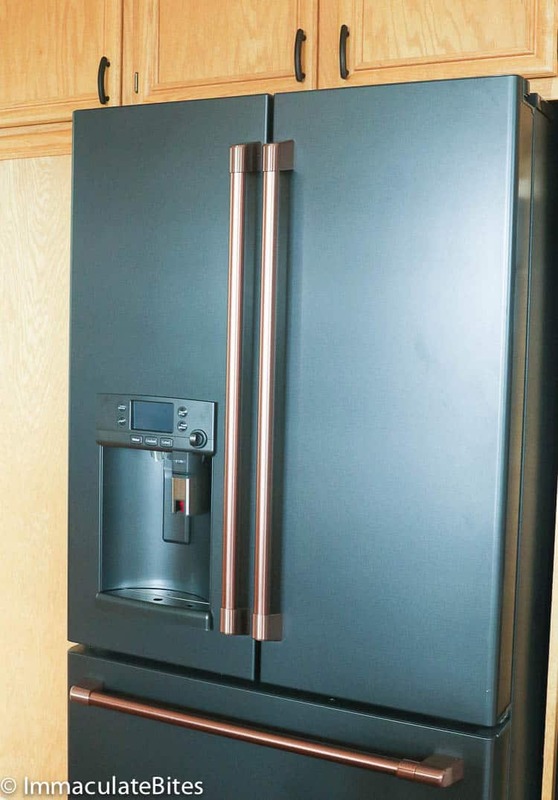 It’s great to see that extra space upgrade in our new Matte Black French Door Fridge with Brushed Copper hardware which we never quite experience with our old fridge. 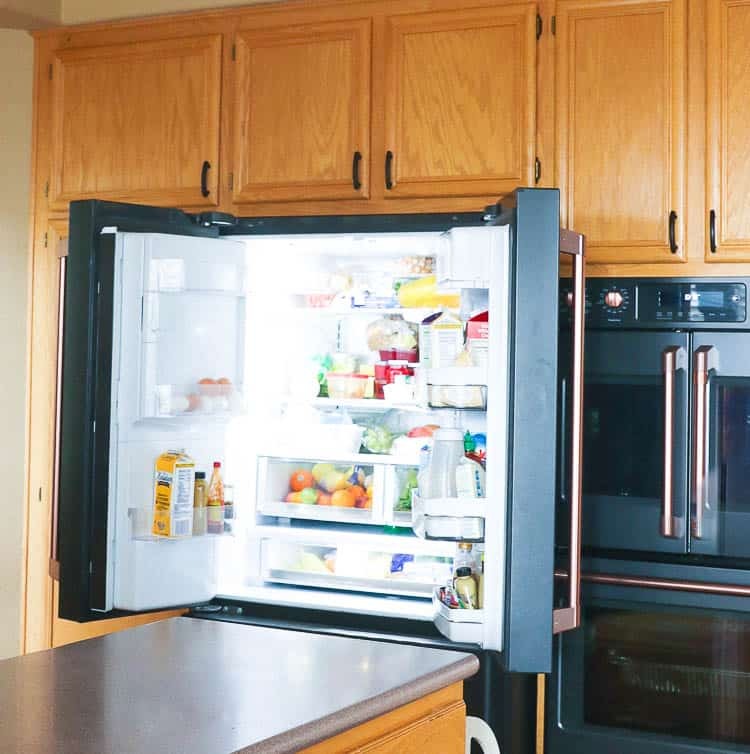 We can easily organize our items in the fridge that makes everything EASY to see. No more rotting tomatoes or lettuce, expired bread or moldy cheese hidden somewhere (Yikes!) 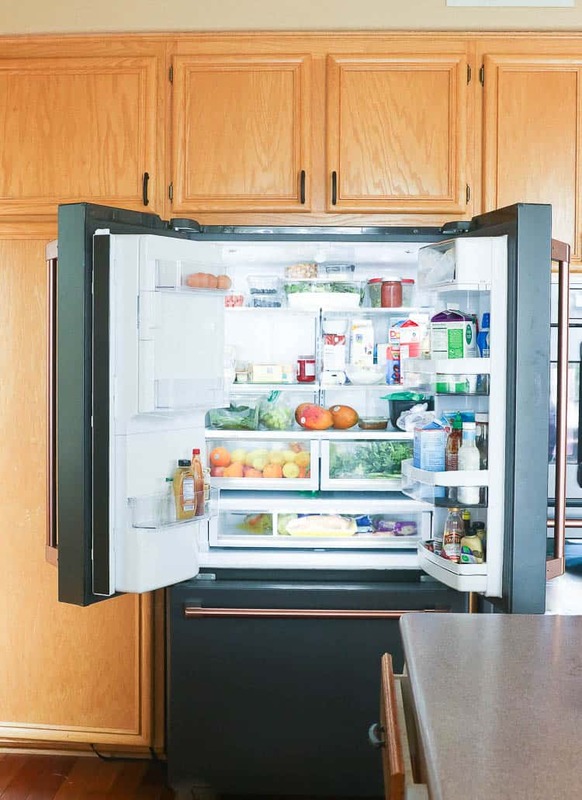 – everything is neatly stuff in drawers and trays with humidity levels appropriate for each food group. Meal prepping and cooking is such a breeze! Every time I open our fridge, I’m always greeted with all those wholesome food reminding me with my goal to eat more healthy food. Aside from that, this fridge has had me drinking a cup of warm tea every afternoon. Yes! It has a cold and HOT water dispenser. I just love how I can easily fill my cup with hot water from its adjustable hot water dispenser that provides exact temperatures and measurements. What impresses me even more is that this feature has made my son able to make his own hot chocolate WITHOUT being told. (I’m proud of you son! Truly I am). All of these little yet notable changes are happening after we got our new Café Appliances. It’s funny how these stunning pieces of kitchen appliances could help us push ourselves to nourish our body. What’s even astonishing about this fridge is that I can easily grab any stuff from it. And did you know that you can open both doors with just one hand? Oh yeah! How freaking awesome is that?!? See the video below for more. If you think you’re in love with this, wait until l I feature in the coming weeks our new cooktop and microwave oven. 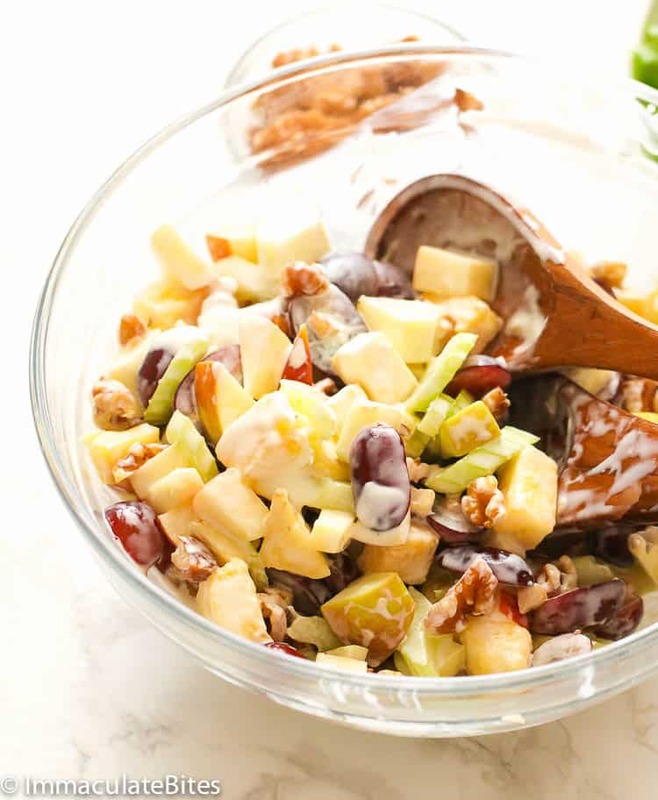 Now that you see what I have in my fridge, let’s talk about our recipe for today – Waldorf Salad. 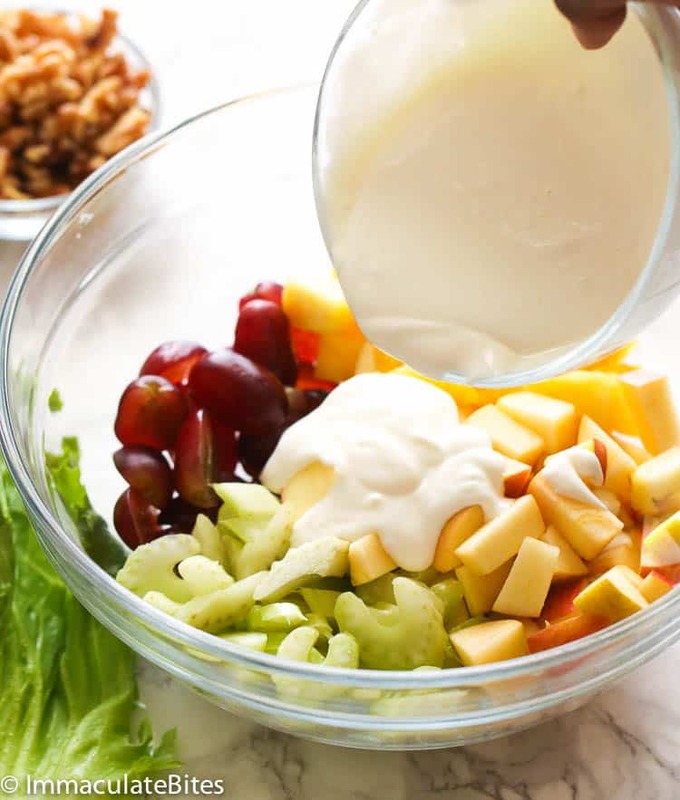 This super easy bowl here is a fruit and nut salad made with apples, grapes, celery and walnuts, coated in a tasty mayo-based dressing and served on a bed of lettuce. What’s the History of Waldorf Salad? The name itself came from a hotel in New York City called the Waldorf-Astoria Hotel. It was in this said hotel that dining room manager Oscar Tschirky created the first Waldorf Salad recipe during a charity ball in honor of St. Mary’s Hospital for Children in 1896. The original recipe said to only have apples, celery and mayo and then later on added with nuts in a cookbook published in 1928. 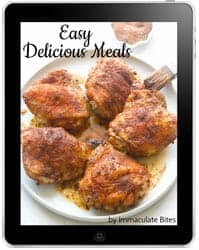 Today, some versions of this recipe would include chicken, turkey, dried fruit, zests of oranges and lemons and sometimes replaces mayo with a yogurt dressing and celery with cauliflower. 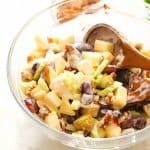 Can I Make Waldorf Salad Ahead of Time? Yes, you sure can. 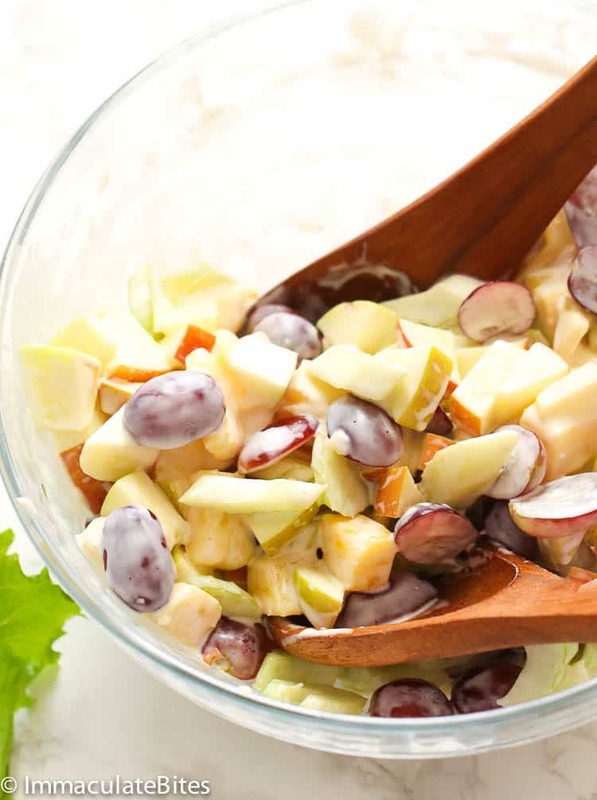 These fruits in this Waldorf Salad can be prepared ahead and mixed with the mayonnaise. I store them in an airtight container in my Café Appliances fridge up to a day in advance. 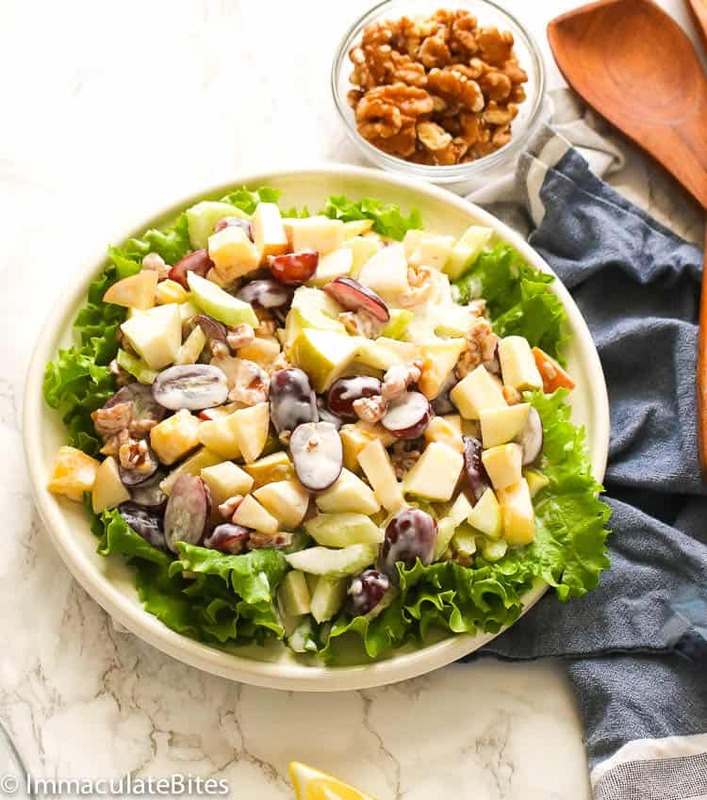 Serve this Waldorf Salad cold as a side dish or a light meal for lunch or dinner. My kiddo even loved this as a dessert. As always, you can add more finishes to suit your liking. This sweet, tangy, fresh, crisp dish is also great for potlucks and picnics. Oh my, did I just say picnic? That means more salad coming in your way. Stay tune! In a medium bowl, mix yogurt, mayonnaise, sugar and salt. Stir to combine until smooth and creamy. Then on a bigger size bowl, throw in diced pineapple, apples, grapes, celery and walnuts. Pour in the mayonnaise mixture and stir well to coat everything. Chill in the fridge for at least an hour. Serve it in a bowl or on a bed of lettuce. Hello! Thank you for dropping by. Can’t wait for you to try it. This is sooo perfect for this weekend. Enjoy!